Bali Ubud Tours is the best Bali Full Day Tour Package and very popular Bali Day Tours in Bali Islands for a Full Day Journey to Visit Tourist Destination and other interest places in Ubud Village the center art and culture in Bali islands. Ubud is a town on the Indonesian island of Bali in Ubud District, located amongst rice paddies and steep ravines in the central foothills of the Gianyar regency. One of Bali’s major arts and culture centres, it has developed a large tourism industry. Ubud is being one of the famous village most visited in Bali islands due this village offered with many kind beautiful art, myth, and history. Is perfect tourist destination for those who love with Art and Culture history. This Ubud Tours will visit places of interest such as Watching Barong Dance performance tells the story about battle between Barong and Rangda, visit Celuk Village is a traditional village for the incredible gold and silver handicrafts, Ubud Batuan Village is a traditional village with beautiful fine art handicrafts, Ubud Batuan Temple is a local Balinese Hindu temple at Ubud Batuan countryside, Ubud Tegallalang Rice Terrace is famous tourist attraction for beautiful rice terraces and small valey, Ubud Monkey Forest is a small rain forest dwelt by some group of monkeys and other tropical animals, Ubud Royal Palace is an ubud kingdom palace with beautiful Balinese traditional houses as a residence of Ubud King and visit Ubud Art Market is a traditional art market in the center of Ubud village. Enjoy Ubud Tours packages with the professional and friendly Bali Tours Driver Service during your holiday by perform excellent services to make Ubud Village journey is memoable one for you and family. Below is a short description about the place of interest you will visit during Ubud Tours. Barong and Kris dance like the kecak dance the Barong and Kris dance is a battle between good and evil spirit. Barong can take various forms but in this dance he takes the form of the dance Barong Keket, the most holy of the Barongs. We will watch this dance during Ubud Tours. The Barong Keket is a strange creature, half shaggy dog, half lion and is played by two men in much the same way as a circus clown-horse. His opponent is the witch Rangda. 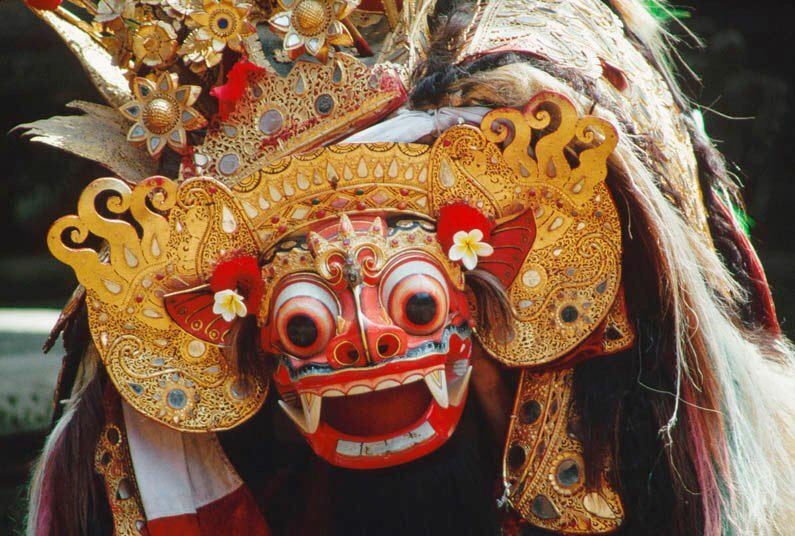 Barong Dance is one of the distinctive arts community of Bali, where Barong it self is symbolic of goodness with shape like a lion. in Barong dance it tells the story about battle between Barong and Rangda. Ubud Batuan has been a village of Balinese Painting Artwork and Bali handicrafts. Batuan village wasn’t influenced by the western as they were in Ubud. The Ubud Batuan paintings were often dark, crowded representations of either legendary scenes or themes from daily life, freakish animal monsters, and witches accosted people. The Ubud Batuan Village paintings were gradations of black to white ink washes laid over most of the surface, so as to create an atmosphere of darkness and gloom. In the later years, the designs covered the entire space, which often contributed to the crowded nature of these Balinese paintings. Ubud Batuan Temple is a local Balinese Hindu temple looked after by the local resident of Ubud Batuan countryside. The temple is designed very beautiful with full of Balinese ornaments and the roof temple building is made from the fiber of chromatic black palm tree. Ubud Batuan Local people are very concern about the care and preservation of the temple architecture and its environment. Not all existing buildings were old buildings here, there are some that have undergone renovation, renewal, and change from 10th century to 13th century and also 18th century AD. The structure and foundation of this Ubud Batuan temple are very tough and strong. Ubud Monkey Forest is a small rain forest dwelt by some group of monkeys and other tropical animals. It is strategically located in the hearth of Ubud Village. Monkey Forests in Balinese language called Wanara Wana are spread out in the island and Ubud Monkey Forest itself own very important function of the continuity the monkey habitat in Bali. Meanwhile the Ubud local community own important role to keep this forest naturally in order to all wild animals able to live smoothly. Ubud Wanara Wana is the name of monkey forest in Sanskrit language. It is important to treat the monkeys with respect as this forest is heir home and you are a guest in it. Ubud Art Market is a traditional art market in the center of Ubud village, where the existence is not far different from other markets available in the tourism area. Ubud Market as a society economics center of Ubud and it is apposite to the existence of Ubud Empire that is called Puri Saren. The market is unfolding from west to easterly divided become two group with different purpose. There are two markets available at the same area those are one block at the Westside is for a traditional artistic market and another block located in the east as an everyday traditional fundamental market requirement.